TREatment of ATopic eczema (TREAT) Registry Taskforce: An international Delphi exercise to identify a core set of domains and domain items for national atopic eczema photo- and systemic therapy registries. The international TREatment of ATopic eczema (TREAT) Registry Taskforce: an initiative to harmonise data collection across national atopic eczema photo- and systemic therapy registries. 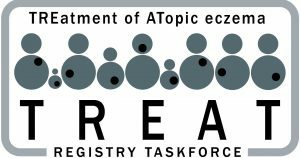 TREatment of ATopic eczema (TREAT) Registry Taskforce: protocol for an international Delphi exercise to identify a core set of domains and domain items for national atopic eczema registries. Usage and effectiveness of systemic treatments in adults with severe atopic eczema: First results of the German Atopic Eczema Registry TREATgermany.